Former Newcastle manager Kevin Keegan says owner Mike Ashley has "had quite a lot of years of making a lot of mistakes" as they prepare for life in the Championship. The Magpies' second relegation from the Premier League in eight years was confirmed on Wednesday by Sunderland's 3-0 win over Everton. "You have to say Mike Ashley hasn't handled the decision-making very well or he's given the responsibility to people and they haven't handled it very well," Keegan, 65, told BBC Sport. Speaking before United's relegation was finalised, he said: "They are going to have to go down and regroup. That's not going to be easy. "You make mistakes in football and you get punished, especially the Premier League now. I think they'll bounce back." Newcastle have only missed two Premier League seasons - in 1992-93 and 2009-10 they were in the second tier - but face a return to the Championship following a campaign in which they have won just eight league games. Having spent close to £80m on new signings during the summer and winter transfer windows, Keegan feels the club targeted the wrong signings. "It is mismanagement from the very top," he said. "They bought players for the future but sometimes maybe you have to buy players for the present. "It's all right having a few good young players from France but can they play in the Premier League now? "If they can't - don't buy them or certainly don't play them. A few of them have found it very tough and the confidence goes and then even good players start to look pretty poor." Former England manager Steve McClaren began the season as boss, but was sacked after winning just six of his 28 Premier League games, leaving the club 19th in the table. Spaniard Rafael Benitez, the former Liverpool and Real Madrid manager, was put in charge to try to recover the season but two victories in the following nine league games did not save the club. 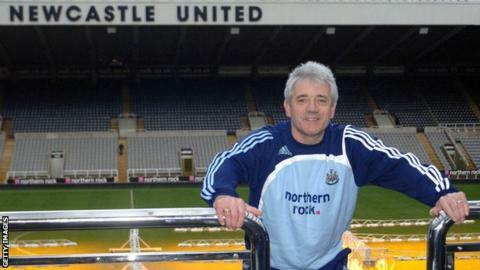 "They started the season with Steve McClaren," said Keegan. "He struggled and I guess he and the guys at the club kept thinking he would get it sorted out and he didn't. "They left it very late and appointed Rafael Benitez and by that time you are looking for almost miracles as you need a lot of points from a few games. "Benitez might fancy it. It is a big club. Once you go there and manage it, it does impress you as a club. The stadium is impressive, the fans and their passion is something that you can't help but like and want to be part of. "He hasn't managed in the Championship - would that be a worry? I don't think so for a man of his experience. It might be a really good experience for him."